I have been asked about crock pot recipes and thought I’d post my version of this recipe from the blog, “100 days of Real Food”, that states that it’s The Best Pulled Pork Recipe In A Crockpot. I started with the author’s recipe but ended up tweaking it so much that it became a version of my own. Don’t get me wrong… this recipe that I’ve linked is stellar. If it looks like one you’d prefer to use, go for it. That’s the beauty of cooking and creating recipes – if you find you’re missing an ingredient, or your family has particular tastes, then by all means alter the recipe to suit those you’re feeding. Remember, there are NO food police… NO wine police… just enjoy the process and have fun creating something tasty! Mix all spices together in a small bowl and then add the honey and wine. Mix to make a paste and set aside. Put onion in the bottom of your crock pot and place the pork on top. Pour spice paste over the pork and allow pork to cook for 6-7 hours, stirring occasionally, until cooked thoroughly and shreds easily. Add wine jelly to the shredded meat and allow it to cook for 10-15 minutes to incorporate the flavors. We found the cayenne pepper to be a bit too spicy in this recipe, so the jelly added a bit of sweetness that really made the flavors pop. Serve warm on rolls with coleslaw, if desired. Also tasty on a salad with some “southwest” flavors added (corn, black beans, cheese, etc). This was an incredibly easy recipe and one that really didn’t need any BBQ sauce or ketchup for flavor. The meat was tender, the onion thoroughly incorporated into the meat, and it got rave reviews in my house. Definitely a KEEPER recipe for me! Hope you’ll consider trying it the next time you want to make a simple, easy dinner. 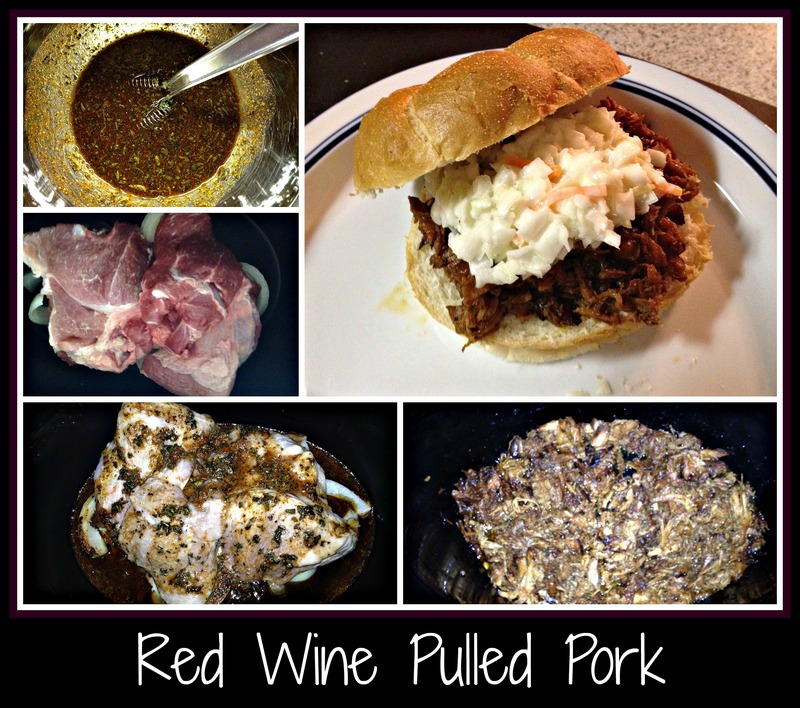 This entry was posted in Cooking, Recipe, Wine and tagged coleslaw, crock pot, easy dinner, easy recipe, James River Cellars Rad Red, Malbec, Pork, pulled pork, red wine, rolls. The wine is called for in the recipe but not listed in the ingredients? Sorry for the delayed response. Wine is actually listed in this recipe after honey. Not sure how I can help you.